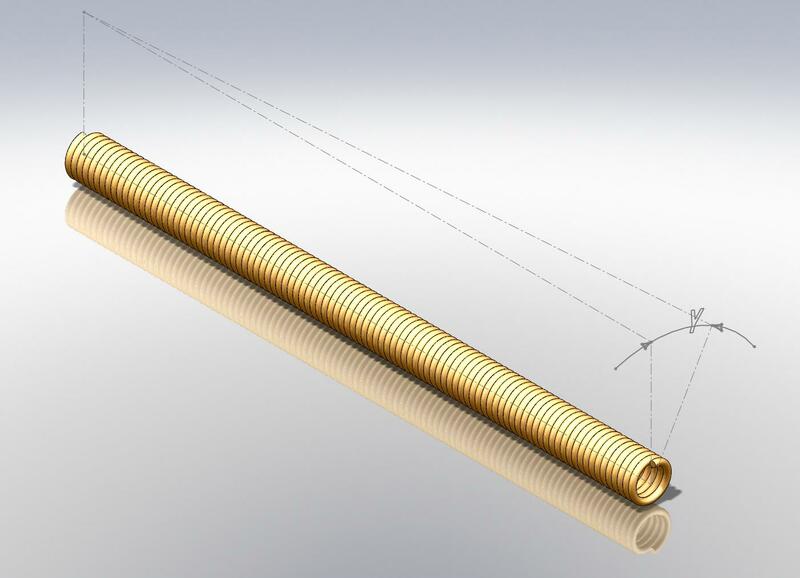 The “heart” of the BIAX flexible shaft, the shaft core, is manufactured from high-quality spring steel and stainless steel wire on automatic machines developed specially by Schmid & Wezel. The shaft cores are still manufactured by hand in the event of special requirement profiles and for very high rotational speeds. BIAX shaft cores can be supplied for clockwise and counterclockwise rotation. The direction of rotation must be selected so that when a load is applied, the outer position of the shaft core closes. A clockwise shaft is used for clockwise rotation and counterclockwise shaft for counterclockwise rotation. Normally, tool drives have a clockwise rotation. 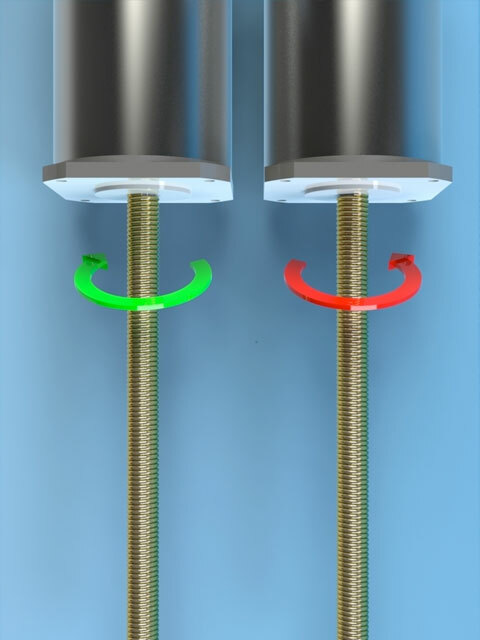 Special versions of BIAX shaft cores can be used in both directions of rotation. The torque to be transmitted can be calculated by using the drive power and rotating speed according to the equation below. The BIAX shaft core must be selected so that it can transmit the maximum torque calculated continuously without becoming damaged. The maximum torque which can be transmitted in the opposite direction is generally approx. 25% less. For reasons of working safety and better channelling of the flexible shafts, we recommend installing a protective tube in the case of fast rotating shafts. Switching and remote control shafts can also be held by means of guide rings. After the winding process, the BIAX shaft cores are subjected to a special heat treatment which achieves the highest level of concentricity for the rotating motions to be transmitted. This enables speeds of up to 50,000 rpm to be realised, a speciality of BIAX. A properly dimensioned BIAX shaft core runs smoothly even when a load is applied. A condition for this is that the permissible torque is not exceeded. The bending radius is a very important factor when using a flexible shaft. Never drop below the minimum values, otherwise the service life will be negatively affected due to heating. You can use the comprehensive product range of BIAX shaft cores to select rigid or flexible shafts for the same shaft core diameters. 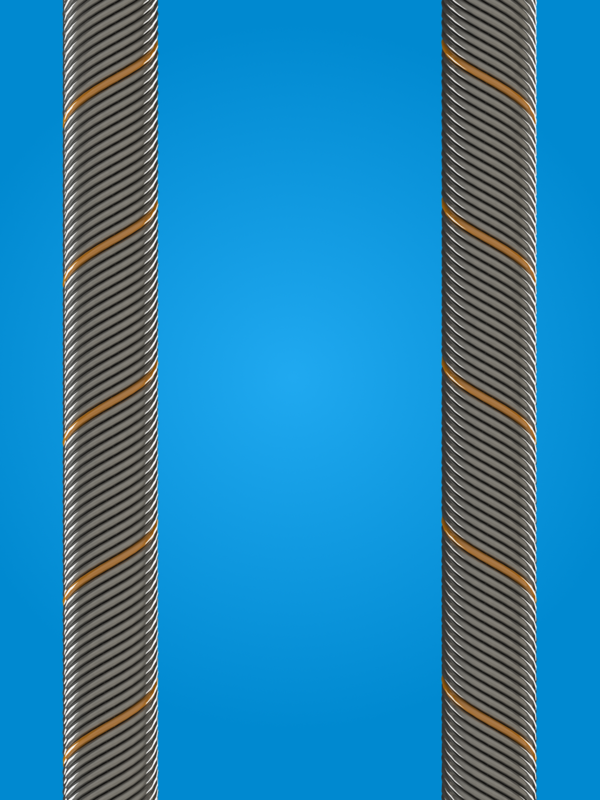 Shaft cores with a larger bending radius generally have a smaller torsion angle [?] and greater torsional stiffness. The distance between drive unit and drive must be measured so that the minimum bending radii are not undercut and the flexible shaft is prevented from bending too much. BIAX shaft cores are supplied in fixed lengths, including with one or both ends pressed into a square shaft. Likewise, on request, we supply bulk goods in various quantities up to a maximum of 1,000 m depending on the diameter. In fixed lengths, the ends can be ground, tin-coated or welded. We supply flexible shafts with connecting parts, with and without a protective tube, as customer-specific one-off productions according to drawings or your technical specifications. We will be delighted not only to advise you in person on the selection of suitable components but also to prepare the design of the flexible shaft. The maintenance requirements depend on the respective application. In normal operation without special interfering factors (moisture, heat, dust etc. ), the shaft core must be cleaned and greased after approx. 200 operating hours. For operation in wet or extreme conditions, however, this is necessary after just 50 operating hours. The grease used must be acid-free, and it is advisable to add Molykote in the event of high-speed applications. For permanent use at high speeds, BIAX has developed a method for greasing the shafts internally. Here, a special procedure replaces all of the air in the shaft core with a high-viscosity, special-purpose grease. This reduces friction within the shaft core while also acting as a grease reservoir, paving the way for extremely long operating times with no need for relubrication. On request, shaft cores (only fixed lengths) can also be supplied with a dry, Molykote-based lubricant. In addition to lubrication, this also provides a largely water-resistant anticorrosive coating. Please complete the questionnaire and return it to us so that we can determine and design the optimum shaft core type and construct complete shaft solutions. Once the technical details are clarified, we will send you a non-binding offer. Metallic, rubber or special protective tubes: we offer you a wide range of possible protective tubes for flexible shafts. Below, we present the types that are used as standard. For customer-specific applications, we offer numerous other possibilities in addition to these, e.g. food-safe tubes, sterilisable tubes (e.g. Viton tubes), silicone tubes, shrink tubes and many more. Precisely adapted to your requirements – contact us now! For complete shafts, the shaft cores and protective tubes are equipped with connections on one or both ends; these ensure a reliable, force-fit connection with the drive and with the driven unit. Take advantage of our almost unlimited possibilities to benefit your requirements! In many cases, customer-specific solutions are also used – and we will be happy to assist you with the implementation.